Do more with less effort: From the moment a referral comes in, until your cash is in the bank, Brightree automates and streamlines every aspect of your business operation. You can do more with less effort. Increase your revenue: Brightree customers increasingly comment on that the new revenue streams they created with our integrated revenue-generating solutions more than cover their monthly Brightree license fees. Manage your business with confidence: With the most comprehensive solution in the industry, you have everything you need to efficiently run your business and improve profitability - all on a secure, affordable, cloud-based Internet platform. Get paid more, faster: As the most comprehensive solution in the industry, Brightree gives you everything you need to improve profitability, collect more of what you've earned and dramatically reduce your DSO. We all know the saying "Time=Money". What if you could spend less time and effort managing billing, inventory and technology and more time on higher payoff activities and patient care? Let Brightree be your guide to maximize the efficiency and profitability of your HME business so you can focus on what you do best. * Offer expires July 31, 2017. Offer does not include training, setup, or fees for any additional Brightree modules. Standard Brightree fees will begin for all services in January 2018. Offer includes monthly license fees and all license/usage fees for Brightree Document Management. Certain rules and restrictions apply for customers who take advantage of 50% off implementation. Please ask your Brightree sales representative for more details. 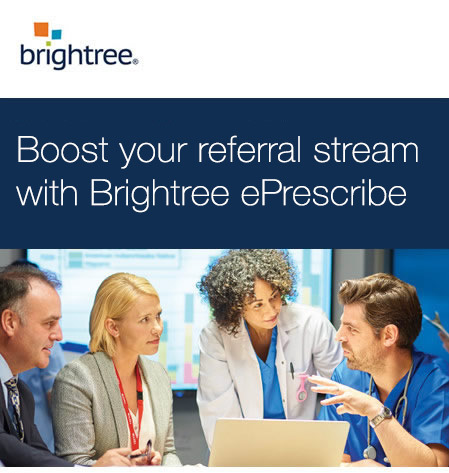 Brightree’s ePrescribe solution uses the latest interoperability standards to allow you to receive electronic referrals directly from your referral sources EHR/EMR systems. This electronic exchange of critical patient data provides your organization with time sensitive referral information, improving both your efficiency and accuracy, without interrupting the clinician’s existing workflow. More importantly, these electronic referrals enable your organization to participate in the interoperable exchange of data that the modern healthcare delivery network now expects and demands. With the right connections, your efficiency and accuracy go up; clinician workflow interruptions and re-admissions go down. ePrescribe: Today’s answer to connecting with referral sources. ✔ Streamline operations – Automation saves time and money and provides immediate access to patient data, which creates a powerful tool for recording, tracking and trending data such as patient vitals and statistics. Additionally, with a reduction in order entry errors, providers feel confident enough in their operations to focus on other value-added tasks that produce better patient outcomes. ✔ Increase reimbursements – eReferral Management gives HME providers greater and more consistent visibility into a patient’s records, treatments and outcomes to facilitate better patient care and more complete and accurate documentation. Submitting more thorough documentation to payers increases the likelihood of faster and fuller claims reimbursement. ✔ Strengthen and expand referral relationships – Today’s physicians are expected to communicate electronically, and now, HME providers have the ability to meet this demand. Through electronic collaboration with interoperable technologies, you’ll be much more attuned to your referral sources needs. ✔ Facilitate better patient care – Having the ability to communicate with other healthcare providers in the patient’s care continuum creates a seamless line of communication, facilitating a better experience for the patient and the provider, including a reduction in readmissions. ✔ Stay relevant – Referral sources want feedback on how well your products are meeting the needs of patients to prevent readmission. With today’s reimbursement models mandating improved outcomes, physicians look to HME providers that can automate functions such as e-Referrals and electronic signatures. Enables your HME as a “preferred provider” to digitally receive orders from more than 100,000 providers using athenaClinicals within the athenahealth network. Bring interoperability to your HME to automate the referral of patients and the ordering process from the health system and hospital setting. Bidirectionally connect with physicians for real-time visibility and less wait time for HIPPA-compliant documentation required for medical necessity and payer reimbursement. Complete the form to schedule a quick Brightree demo. Nurture your referral sources with Brightree's ePrescribe solution; Fill out the form or call 1.888.598.7797 to schedule your personal demo. Copyright © 2018 Brightree LLC.